Wakefield, LA; Shofer, FS & Michel, KE (2006). “Evaluation of cats fed vegetarian diets and attitudes of their caregivers” .Journal of the American Veterinary Medical Association, 229 (1): 70–3. She does housecalls in NYC, and her site is ComfortsOfHomeVet.com. Lorelei is vegan. Her own cat, Noel, used to be vegan but is now on a meat-based prescription food. In between extreme ironing , vegan campaigning, and writing a cost/benefit analysis of Animal Experiments, Andrew Knight also runs VegePets.info, which offers advice for people considering vegetarian diets for dogs and cats. Jean Hofve is a retired veterinarian with an interest in nutrition and alternative veterinary medicine. She writes at Little Big Cat .com, including about vegetarian cats. Erin offers listeners to Red Radio “vegan banter with a bite” – strong vegan opinions and supportive commentary, as well as guests, compassionate clips, and rants. She’s Canadian transplanted to Brooklyn, where she co-founded “The Seed: a vegan experience”, and practices muay Thai. Erin can be found at Tumblr (currently), ErinRed.com (under construction), and@ErinRed on Twitter. She discussed the ethical dilemma of vegan cats with Prof Gary Francione in a February 2012 episode of Red Radio. 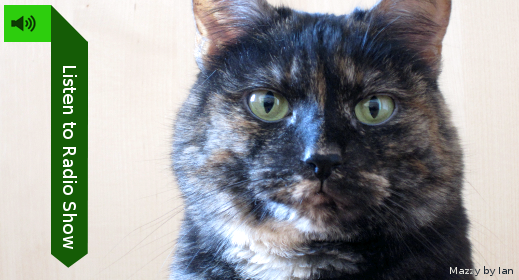 Mazzy is a female tortoiseshell rescue cat, and she’s on my lap as I’m typing this. She’s also had struvite crystals (when on a meat-based diet) so she’s also on a meat-based prescription diet. … while both species can eat and utilize some plant-source ingredients (dogs more than cats), they simply are not intended to eat only plants as are other animals such as cattle and sheep. When it comes to felines, it really is best to provide a diet that includes meat. The show specifically discussed how cats need Taurine and B12; and the dangers of urinary struvite crystals. Colleen Patrick-Goudreau addressed the issue in her 2007 podcast episode, What do Vegetarians Feed their Dogs and Cats? – and, as I mentioned, feeds her cats meat. US writer and activist Jo Stepaniak blogged about how she feeds her cats meat after they did not thrive on a vegan diet. Vegan vet Armaiti May advises having a vet monitor your cat’s urine pH, rather than doing it yourself. Animal Voices (Toronto) covered this topic in 2006 with a round table discussion, involving two local activists whose cats fell seriously ill on a vegan diet, as well as Eric Wiseman of Evolution pet food. … go to Robb Masters for the music, the three veterinarians for our interviewees, and of course Erin Red. The interview with Andrew Knight is from back in 2010, hence some rookie mic handling noise. This is not veterinary advice. It is a radio show with vets. Hello Mr. McDonald I am writing pertaining to Vegan cats. I have been feeding my cats Evolution Diet Kibble Moistened food successfully for 22 years now. I started in 1991 when we rescued a 6 week old tabby that was abandoned and who we named Mussi. Mussi inexplicably developed diabetes at just one year old, I was shocked to learn this and I started to research the possible causes of his condition and the primary culprit turned out to be commercial pet food. I thought I was feeding my kitty “healthy” food boy was I wrong. Like most people, I fell under the spell of the commercial pet food advertising campaigns and didn’t question it. I was shocked to find that all commercial pet food companies profit by disposing of toxins and poisons from the slaughterhouse and other industries and adding it on pet food as fillers and additives causing sickness and deaths of millions of pets annually. I searched for alternative foods free of toxins and found at that time two feline food products that met all the nutrient requirements for cats. One food is http://www.VegePet.com and the other is Evolution Diet http://www.evolutiondietstore.com I started using evolution diet on Mussi and his diabetes reversed completely in about 4 months. This was nothing less than miraculous because the veterinarian told me that Mussi will be diabetic for life! After this experience that threatened the health and life of my loving Mussi and being completely cured from a disease that was clearly caused by the commercial pet food, I never looked back. Mussi was cured and never developed diabetes again with the vegan formula from Evolution Diet. I only rescue FIV’s and all love and thrive on Evolution Diet Kibble Moistened food. Finally I will say to those who say that cats are carnivorous which they are, that giving them a vegan food that it is complete in nutrients and it does not have any toxicity is by far much better than any commercial pet food out there. I also feel good knowing that I am not poisoning my cats and also I do not support the slaughterhouse, animal killer industry. Lastly, we need to remember that even though cats are carnivorous, like all animals they adapt and also cats are not really a part of nature but rather animals that humans bred and created to exploit, so introducing cats outdoors is not a good idea at all because they kill native species and cause tremendous damage. It is best to have your cats indoors and feed them a vegan diet free of all the poisons the commercial pet food companies have. Thank you for your comment, and I”m glad that Mussi is doing well. There’s some discussion of the use of slaughterhouse waste in pet food lined up for the next show. The accusation that “toxins and poisons from the slaughterhouse and other industries” are added to pet food isn’t currently something I’m planning to include in the show. If you’d like to be really specific about what you mean, with reliable sources, then I’d be very interested to take a look. Mussi’s recovery from diabetes sounds really interesting, but I’ve got a couple of questions. If he was “completed cured” in 1991, why did Alternet report Mussi needing Insulin in 2004?. I’m also not clear what he ate, as Alternet also report you feeding him homecooked meals with Vegecat. And would it be okay to confirm details with the vet who treated Mussi in 1991? I am trying to switch my cats to vegan diet. Is there by any chance I could call /email you to talk more about this. Alfredo Kuba hasn’t replied to my questions in 14 months, so I’m not optimistic you’ll get a reply from him. I should also point out that my questions are partly about major contradictions in the accounts he’s ostensibly given different outlets. Andrew Knight is a vegan veterinarian who advocates a vegan diet for cats: you can hear his advice in this show and the next, and have a look at his website VegePets.info. If you are on FB, you should check out the Vegan Cat group https://www.facebook.com/groups/126322004672/. There are 1,500 members. My 8 cats have been vegan for 3 years. I use mainly Benevo dry with a bit of Ami dry, and recently Evolution canned as a treat.